Debate over this bill (consolidated from several committee bills) is expected to begin next week. If this bill is passed, it would then go on to be consolidated with any legislation passed by the Senate. There is still one key issue dividing Democrats in the House that could stall the bill – the use of federal money to pay for abortions. Nursing Home Costs Approaching $80K/year: According to a just-released study conducted by MetLife on the costs of long term care, private room nursing home rates rose 3.3% to $79,935 per year or $219 a day, assisted care living rose 3.3% to $3,131 per month, adult day services increased 4.7% to $67/day, and the hourly wage of home health care aides increased 5% to $21 an hour. $800 Billion Wasted Each Year in Health Care: According to an independent report by Reuters, $600-$850 billion a year is wasted by the health care industry. The biggest categories of waste identified were administrative inefficiencies, unneeded medical services, and fraud/abuse. Health Reform to Lower Costs for Small Business? : The HHS released a report this week explaining how businesses will see lower premiums if health care reform legislation supported by the White House is passed. It is an interesting read for you small business owners; just remember this isn’t an independent report. Gerber’s Med Supp Now in CA and IL: Gerber Life’s Medicare supplement was released to consumers in CA and IL today. Just in case you may not have heard, Gerber Life’s Medicare supplement is now available to consumers in 23 states. To view the marketing materials for this product click here. If you have any questions regarding this product, please feel free to contact us. Doctors May Face 21% Pay Cut: This week a bill named the Medicare Physician Fairness Act was voted down by a vote of 47 to 53. This bill sought to eliminate the current automatic payment formula for physicians that recommends doctors’ Medicare pay be cut. This year the formula recommends that physician pay be cut by 21% in 2010. Supporters of the bill say that the pay cut will mean that doctors will increasingly refuse to treat Medicare patients. Opponents of the bill argue that eliminating the formula without a replacement would add $246.9 billion to the national deficit. American Medical Association President-elect Cecil Wilson, M.D. states that physicians face Medicare cuts of about 40% over the next five years. Medicare Fraud Grows: A very interesting article appeared on CNN this past week detailing the rising amount of Medicare fraud among organized crime gangs. They provide the example of crime boss Konstantin Grigoryan, a former Soviet army colonel who took more than $20 million from Medicare. They also note several other examples of multi-million dollar Medicare scams. Essentially these gangs steal doctors’ and patients’ identities to file false claims to Medicare and Medicaid for millions. To read more about this, click here. The Beginnings of US Insurance System: This may be old news for some of you, but for those of you who want to know more about the history of the industry we work in, NPR has an educational article summarizing the history of the current U.S. health system. It’s surprising to think that we aren’t that far removed from a time when doctors advised people to transplant a goat gland into their bodies over the radio. To read the article, click here. Stricter Background Check Proposed: The Senate Finance Committee amended a new provision to its health care bill that requires stricter background checks for nursing home workers who have direct access to patients. The provision was offered by Sen. Debiie Stabenow (D-Mich.). The big news of the week was not so much the passing of the Senate Finance Committee bill as was expect, but rather it was the single Republican vote of support by Maine Senator Olympia Snowe. Snowe stated that the bill is not perfect, but does represent the best balance of what has been proposed thus far. She further commented that the threat of maintaining the status quo is too great to Americans. More liberal Democrats also chimed in stating that the bill was far from their ideal, but supported it with the hope that it could be reshaped later. President Obama described the passage as a “critical milestone” towards achieving health care reform, as the event advances current health care legislation further than any other attempt over the past several decades. Now the Finance bill will most likely go through a process of merging with a bill passed earlier by the Health, Education, Labor, and Pensions Committee. The big point of contention will be whether a merged bill will include a public option. The Finance Committee bill doesn’t include it, while the latter does. This process will not be a walk in the park if the merging of legislation approved by three House of Representatives Committees is any indication. The details of a merged House bill are currently the source of much frustration and struggle in the House. As health care reform progresses, insurance companies and industry representatives are ratcheting up their opposition to much of the legislation currently under consideration. AHIP this week released a PricewaterhouseCoopers Report on the Impact of Reform Proposals on Costs that essentially states that the Finance Committee bill will raise premiums significantly for most people who already have insurance. The report can be read here. The report is currently being criticized for only analyzing four provisions of the bill. Additionally, AHIP is running TV ads in six states criticizing current legislation for making more than $100 billion in cuts to Medicare Advantage and reducing benefits to seniors. Internet Use Decreases Senior Depression: The Phoenix Center, a non-profit research group, released a report today that shows seniors who use the Internet can reduce their depression by 20%. The report further states that reducing depression can lead to decreased health care costs for both seniors and the industry in general. The report explains that the Internet facilitates increasing communications with family, friends, and society at large especially for seniors who have mobility difficulties. For the full report, click here. No 2010 COLA Increase Official: On Thursday, the Social Security Administration officially stated that there will be no automatic Cost Of Living Adjustment. The SSA explains that due to the recession there was no inflation this year, thus no need for a COLA increase. To offset this, President Obama on Wednesday announced a $250 Economic Recovery Payment to seniors, veterans, and disabled people who have not recovered from their losses from the recession. The payments are expected to go out to more than 50 million people. For more information click here. H1N1 Flu Information for Seniors: CMS now has a Web site with information specifically for people on Medicare and Medicaid. Click here to visit the site. 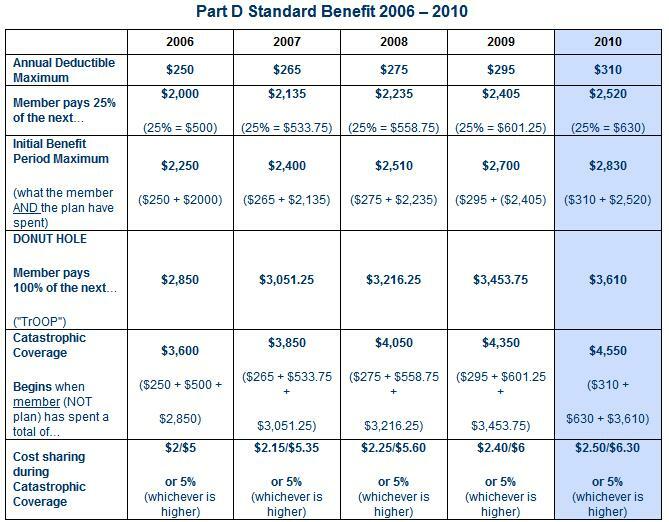 Standard Prescription Drug Benefit for 2010 Info: The Center for Medicare Advocacy, Inc. has a great comparison chart showing info regarding Part D standard benefits Info. For more information on the subject, click here. As many of you already know, Medicare's Annual Open Enrollment begins November 15 and will last until the end of the year December 31. The Centers for Medicare & Medicaid Services this week released the final $6.3 million of a total $49.6 million in total funding allocated for State Health Insurance Assistance Programs (SHIPs). SHIPs use this money to fund local community programs that provide personalized help to Seniors who want to know more about Medicare and other health insurance information. SHIP programs are expected to focus heavily on less fortunate Seniors who typically have little knowledge of the Medicare system and the benefits they are entitled to. For more information on the SHIPs in your state, click here. For this open enrollment season many in the industry expect to see an increase in Medicare supplement enrollments due to several changes to Medicare Advantage that will occur in 2010. MA beneficiaries can expect to see an average premium increase of nearly 22% (a $7 increase to $39/month). Despite the increases, CMS states that roughly 87% of Medicare beneficiaries will still have access to a MA plan that doesn’t require a premium. Additionally, CMS expects 7% of MA beneficiaries will have to choose a new health plan or a Medicare supplement as their plans (typically PFFS and low enrollment plans) will be discontinued at the end of this year. CMS will also increase its oversight of Medicare marketing activities. There are now stronger rules governing the commissions that can be paid to independent sales agents and how MA plans identify themselves. CMS will significantly increase its secret shopping activities, including individual marketing sessions. So we advise that you be extra vigilant in your compliance efforts this season. Mutual of Omaha has already published its disenrollment guidelines, which you can check out here. As usual, Seniors will have access to www.medicare.gov and 1-800-MEDICARE this season. Of course, these are good resources for agents such as yourself, if only to ensure that your information aligns with the official source. For all open enrollment related information, click here. As always, we’ll keep you updated with the latest news and product information to help make this open enrollment season a successful one for your organization. Public Option No Longer an Option? On Tuesday the Senate Finance Committee rejected two health care public option proposals. A handful of moderate Democrats and all 10 Republicans on the committee voted to exclude a public option from the current, $900 billion, 10-year plan under consideration. The first proposal was rejected 15-8 with five Democrats opposed, while the second proposal was voted down 13-10 with three democrats voting against. Depending on the slant of your news source, some consider this to be a death knell for the public option as this vote indicates that supporters are short of the 60 votes needed to prevent a filibuster and get the public option passed. Those is support of the public option state that this recent rejection doesn’t matter since the real points of contention are when the time comes to merge the finance committee bill with a bill from the health committee that does include a public option, and later when Senate legislation must be merged with legislation in the House that also includes a public option. The Senate Finance Committee proposed its own alternative to the public option – non-profit health insurance cooperatives. Proponents of this option believe that absent the focus on profit, such cooperatives will provide greater value and quality for its customers. Opponents cite the lack of historical data as a primary reason why such cooperatives are not a viable alternative. Now that insurance cooperatives are in the national spotlight, more studies are expected to take place to assess their feasibility. Life Insurance Selling Grows: According to the Pittsburgh Post Gazette, the current economic hardship has resulted in a dramatic increase of senior citizens selling their life insurance policies in order to get cash. However many of these senior don’t realize the possible negative consequences of doing so, such as losing Medicaid status, having to provide all medical records to investors, and tax issues. Though a $12 billion industry, little regulation exists. Now Sen. Herb Kohl, Chairman of the Senate Committee on Aging has requested the SEC to look into industry practices and provide better rules and regulations to better safeguard seniors. Part B Increase News: The House passed a bill that will prevent an increase in the Medicare Part B insurance. The bill makes $567 million available to pay for the additional cost. To become law, the bill still needs to be passed by the Senate and signed into law by President Barack Obama. Next up for the bill – the Senate Finance Committee.